Thanks for coming along this tasting! If you liked any of the wines or wanted to purchase any as a gift for the next few months, you can view each wine at Dan Murphy’s via the links below. For every online purchase made via the links below, Wine Wisdom Made Easy receives a commission. However, the price you see when clicking through these links is the same as it would be from a Google search or any other regular source. The commission is taken from the retailer's profit margin and not passed on to you as purchaser. Wine Wisdom, in turn, passes a portion of profit from commissions to a charity called Sightsavers, as part of the 'Vino for Vision' giving program which aims to help prevent blindness in developing countries. The wines below are mostly $25 and above because our tasting was about trying some really special wines with distinctive characteristics. However if you prefer wines that are still great value but not as expensive, have a look at my recommendations for the $15-$25 price range. If you prefer to purchase from other wine retailers, please do. You can still use the recommendations on this site to guide your purchases. 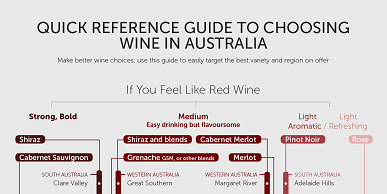 You can also download a free guide to choosing wine at the bottom of this page. This bracket was all about the difference between vintage and non-vintage sparkling wine. A great example of the non-vintage style. See the full write up here. Better length although less ‘lifted’ aroma. This bracket was initially about the effect of decanting - it made the wine more aromatic but the taste was less appealing (because Sauvignon Blanc is not made to be decanted). Then we compared the ‘benchmark’ examples of Sauvignon Blanc from Australia and New Zealand. A mix of passionfruit and grassy, herbal characters. More aromatic and ‘loud’; more tropical fruit characters. This bracket was all about comparing trendier, ‘sparse’ and ‘lean’, citrusy Chardonnay against big-flavoured ‘old school’ Chardonnay. Trendier - Less aromatic, leaner but still great length and structure, more subtlety, detail and complexity. Aromatic, (blackberry) not very ‘long’ in terms of persistence of flavour. Not too much tannin. Some bitterness in the tannins at the end. More ‘lifted’ or aromatic, (chocolate, mint, capsicum, blueberry, burnt toffee). Smoother, more persistent flavour, more tannin. A little ‘angular’. We finished with my favourite wine of the night which was identical to the Cabernet above, except that it was five years older. It was smoother, more integrated, had great structure and length of flavour, plus ‘secondary’ characters (a little ‘leathery’!) which added to the ‘primary’ fruit characters.